The 2016 Fanatic SUP Collection is now online here: http://www.fanatic.com/sup/. There is a lot of new stuff, especially in the area of inflatables. The new super lightweight double layer light technology makes the boards about 30% lighter yet stiffer. 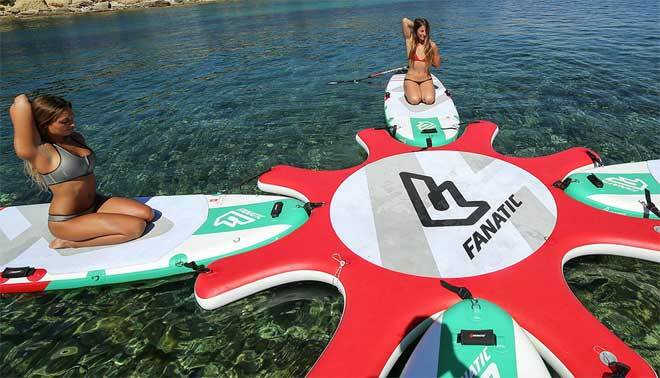 There are new shapes like stubby air for waves and rapid air for white water and there is the brand new Fly Air Fit board for Yoga and Fitness which can be combined with a platform which can connect up to 8 boards. The inflatables also come with new wheely backpacks and a completely re-designed powerpump. The Raceboard lineup has been split into the Strike for Flatwater and the Falcon for the ocean. The Strike has a deep cutting bow and is only available in 14′, the Falcon has a more rounded nose shape which is better for ocean racing. The new Carbon Pro paddle only weights 500g and there now also is a carbon fiber paddle for kids. You can download the new catalog here. Fanatic team riders Klaas Voget, Kai-Nicolas Steimer and Paulina Herpel went for a SUP adventure in Hamburg city. “Moin! Moin! Fly Air Inflatable Fun in Hamburg” shows how much fun Stand Up Paddling in the city can be. Follow our riders through small canals, paddling through the famous Speicherstadt, at the Alster or in the middle of Hamburg´s huge port! Everybody who has been travelling with a SUP knows what for a pain this is. If you are tired of carrying around your SUP, you might want to consider an inflatable. Have little rubber fins that to not give much traction and no special fibers or stringers that make the board rigid. They bend like bananas for heavier riders but can still be good fun for lighter riders and make the sport easily accessible. have a full size fin with US Finbox System and better traction. They usually also have sytems that make them more rigid. The new inflatable Touring and Raceboards for example from Fanatic or Mistral are really good. I would always choose an Inflatable race board (e.g. Fanatic Fly Air Race) over an Allround SUP with the rounded Shape (e.g. Fly Pure). I would always choose an carbon race board over an inflatable race board.